Prosimo, če se tisti, ki bi to nedeljo radi igrali, čimprej prijavite na Warhornu! In researching a recently recovered druidic lorestone, the Pathfinder Society learns of a powerful artifact with the power to turn men into bestial abominations. Amid claims of increased werewolf activity in the region, the PCs travel into the heart of the Verduran Forest to retrieve the valuable relic from a cabal of evil druids believed to currently hold it. The Pathfinder Society discovers an Aspis Consortium base in an ancient Vudran temple now encased in a glacier and sends the PCs to infiltrate it and investigate the extent of the rival organization’s regional operations. Can the PCs get in the well-guarded Aspis outpost and escape with their lives and the information the Society seeks? This entry was posted in Pathfinder Society and tagged D&D,dungeons and dragons,pathfinder,pathfinder society,pfs,roleplaying,RPG on 18.06.2013 by zlatigoblin. To nedeljo ob 17h si rezervirajte čas za PFS. Detajli sledijo s strani našega novega Venture Captain-a Janija! 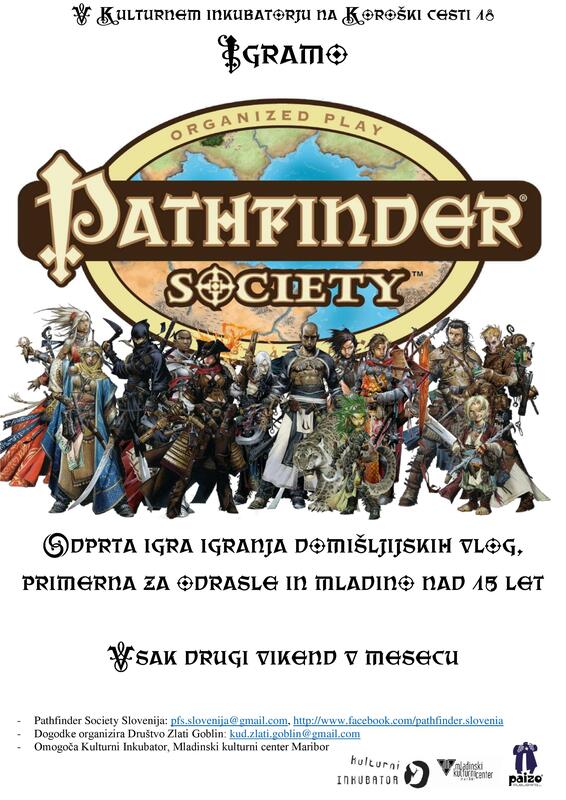 This entry was posted in Uncategorized and tagged pathfinder,pathfinder society,pfs on 17.06.2013 by zlatigoblin.